Muzzle devices have long been one of the most overlooked components of any AR-15 rifle. They have a massive impact on how well your rifle is able to shoot, such as the level of felt recoil you feel and how much flash you will see each time you fire the rifle. In this article, we will cover the pros and the cons of the various AR-15 muzzle devices that are out there, as well as some specific examples of high quality makes and models that you can choose from. A muzzle brake is designed to re-direct high pressure and high velocity gas to the rear of the weapon, which will translate to less felt recoil and enable you to better control your firearm. This also means that making fast and accurate follow up shots is significantly easier when using a muzzle brake, including if you were to fire your weapon rapidly or with full auto fire. 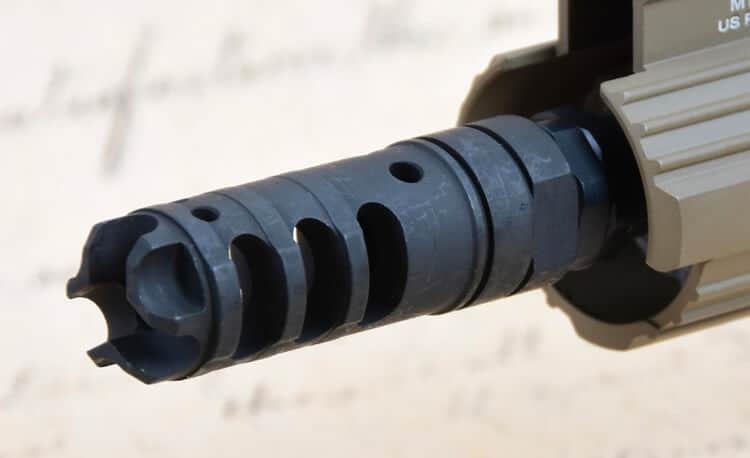 The biggest negative to using a muzzle brake is that it does a relatively poor job of reducing the amount of flash you will see after pulling the trigger. This means that you night vision in particular could be impaired. 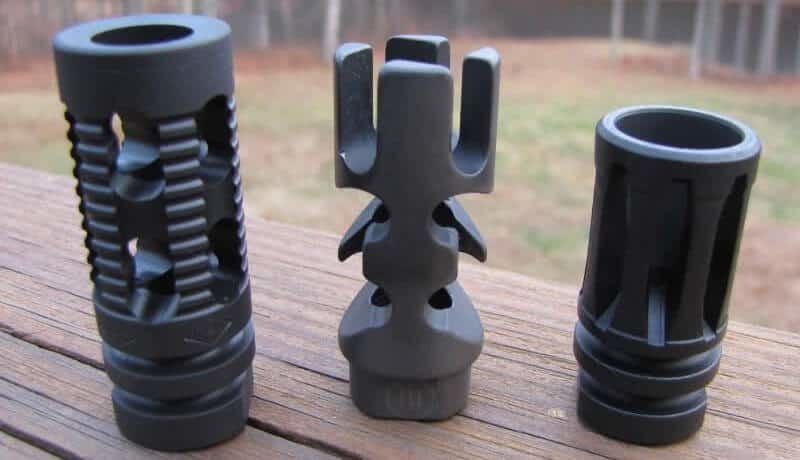 In addition, a muzzle brake also creates a larger amount of noise, which is not something that you or anyone else around you is going to particularly like. A flash hider is designed to manipulate the vented gas in order to reduce muzzle flash. This is beneficial because in the dark or dim shooting positions, your vision will not be impaired at all. But on the other hand, a flash suppressor will do nothing to reduce accuracy and recoil that you will experience. In other words, it will do nothing to make your firearm any more controllable or accurate, like the muzzle brake will do. 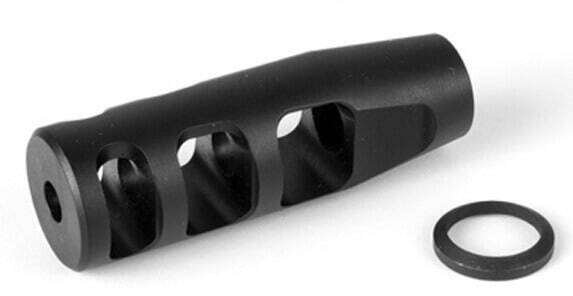 One of the most special flash hiders is the Vortex Flash Hider. Built specifically for the AR-15, it has a eight of three ounces and a length of two and a half inches. It is designed to be tightened by hand, and the more you fire the rifle, the more flash hider is tightened so you don’t have to worry about it coming loose. The Vortex Flash Hider has been commonly cited as being one of the very best flash hiders on the market, including being superior to the M16A2 bird cage flash suppressor that is much more common. A compensator is designed to reduce muzzle flip by redirecting high velocity and high pressurizer gasses upward. This serves to reduce muzzle flip, otherwise known as muzzle climb, which translates to faster and more accurate follow up shots and rapid fire. But as with a muzzle brake, a compensator does literally nothing to reduce the noise or flash suppression of your weapon. Subsequently, it may not make your AR-15 any more pleasant to shoot, other than that it makes it much easier to control. One of the more popular kinds of AR-15 compensators is called the Linear Compensator. It’s been called a “poor man’s suppressor” and serves to direct muzzle blast away from you rather than suppress it. Muzzle devices are not legal in every form they are available in in the state of California. In 1989, California made it illegal for shops to sell firearms that the state deemed to be assault weapons, and any citizens who owned them already were forced into registering them. In 2016, another law was passed that made owning so-called assault weapons even more restrictive, and to the point that rifles such as the AR-15 could only be owned if they lacked certain features. Unfortunately, any muzzle devices that hides or suppresses flash is not legal in the state of California. The Strike Industries J Comp, which is also very cost effective and can be owned for less than forty dollars. LANTAC Dragon Muzzle Brake sports vertical ports in the primary discharge chamber to help reduce muzzle rise when you fire the weapon. Meanwhile, the short energy pulse system reduces recoil as well, and enables fast and accurate follow up shots. Even if you were to fire your AR-15 in fully automatic, you will notice that your shots will be fairly easy to land on target. The Dragon has also been built out of an extra durable stainless steel, which makes it nearly impervious to corrosion, wear, and heat. You can easily install it thanks to the flats on the side that make it easy to install with any standard wrench. The VG6 Gamma 556 Muzzle Brake is actually a compensator and muzzle brake hybrid, which is pretty cool. It is also designed to keep muzzle movement and recoil to a minimum. The fact that this muzzle brake can both compensate and brake allows you to make faster follow up shots. The unique geometries inside of the chamber also means that shooting this rifle should feel very soft to you, and the gas ports dimensions have also been tested thoroughly to make the rifle as easy to control as possible when this muzzle brake and compensator hybrid has been added to it. It’s also available in bot ha bead blasted or black stainless steel finish. The Smith Enterprise Vortex G6-A3 Flash Eliminator is designed to hide over a hundred percent of muzzle flash, including during fully automatic fire. This is partially due to the fact that the rifle is built out of the same 8620 bar stock steel that is used in the bolts and carrier groups for AR-15 rifles. It also has a helix design that helps to align the exiting barrel gas to help aid with better accuracy as well. It also has a grooved base ring that makes it easy to integrate a BFA, or Blank Firing Attachments, that is commonly used by law enforcement units. The recommended torque of this flash eliminator is ten feet per pounds. 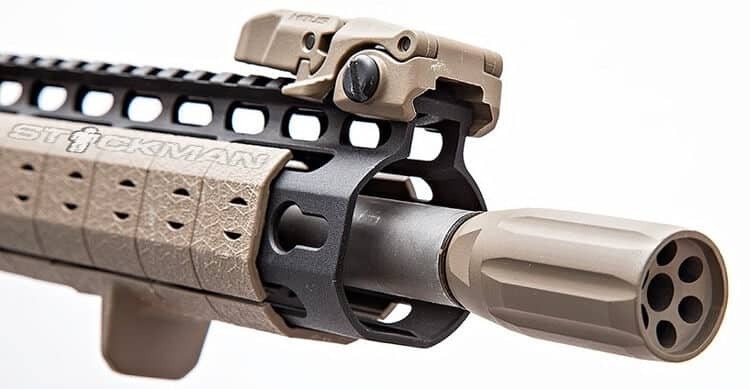 The Strike Industries Venom Flash Hider is marketed as being one of the most effective flash hiders on the market, due to the fact that it eliminates around one hundred percent of muzzle flash as well as easily dispersing of all of the burning gases that explode from the barrel. Not only will this help make your AR-15 easier to shoot, it will also give you much faster follow up shots as well. The recommended torque of this flash hider is fifteen to twenty feet per pounds. The Noveske KX3 has a unique design in that it redirects the concussion forward to provide even superior flash suppression in contrast to the A2 standard suppressor, which is far more common. This design enables side blast to be nearly eliminated, making the Noveske KX3 an excellent choice for close quarters tactical use. It also reduces felt recoil and muzzle rise to help you to better keep your sights on target as well. Installation is also easy since it can be easily installed using a 3/4” wrench. 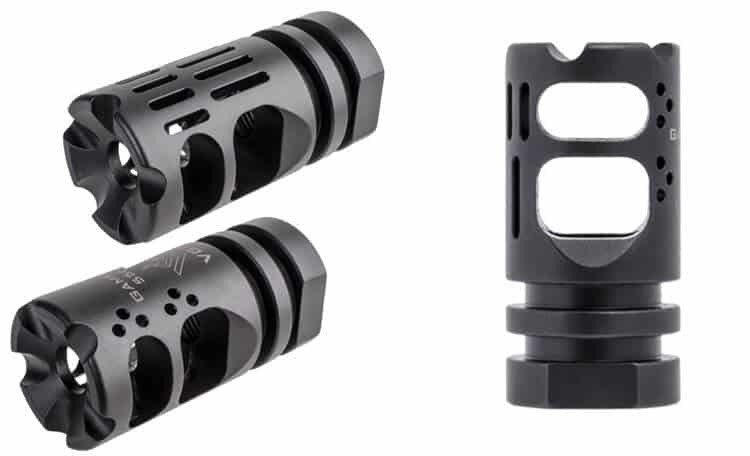 The Odin Works Atlas 5 Compensator is one of the more innovative muzzle devices on the market. This is because it utilizes a unique three piece modular design to make installing the compensator on your rifle incredibly simple. This compensator also produces significantly less recoil for your AR-15, allowing your follow up shot to be fast and accurate. The compensator is built out of 416R stainless steel and is then coated in black nitride for superior rust and corrosion resistance. Compensators may be easy to make, but they are not easy to perfect. The JP Enterprises 3 Port Compensator is regarded by many in the industry as being the gold standard for compensator performance. Long tweaked throughout its life, the JP Enterprises Compensator comes with the compensator itself in addition to an instruction sheet and crush washer. It results in minimized muzzle rise and reduced recoil fatigue. This will help translate to faster and more accurate follow up shots in contrast to if you were to not use this compensator. As an added bonus, it’s 100% percent made in the United States as well. The KVP Linear Compensator is part of a series of KVP muzzle devices that are all together designed to redirect the muzzle gas downrange after collecting them. This will help to reduce the level of noise that you hear when you fire your rifle, which is especially useful for SBR’s and AR-15 pistols that are notorious for creating a large volume of sound. In short, the KVP Linear Compensator will be a good choice for SBR’s and pistols and other firearms that are designed for close quarter combat. 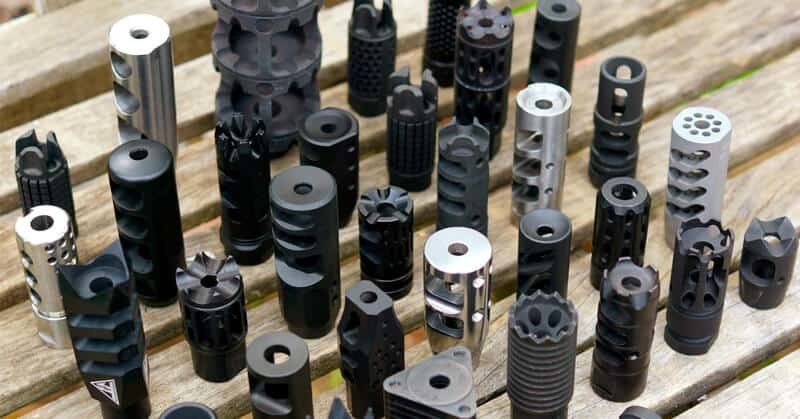 Based on the information in this article, you now not only know what the various options are for muzzle devices for your AR-15 rifle, you also know what some of the best makes and models are for those various muzzle devices as well.